Henri Cartier-Bresson is the father of modern photojournalism and widely revered as the pioneer for the art of street photography. I was watching one of his documentaries and one of his quote struck me; referring to his timeless street photographs, he said “It’s always luck. It’s luck that matters. You just have to be receptive, that’s all.” Nothing can be more true about street photography. Of the 2 short years that I’ve shot in the streets of Singapore, I do not deny how luck dictates if I get a keeper or not. No matter how good a photographer you are, if lady luck is not on your side, you will end up capturing boringly normal street scenes that we can all see everyday anyway. 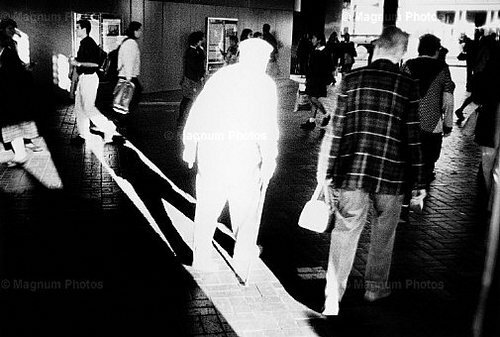 If it wasn’t for luck, Henri Cartier-Bresson wouldn’t have been at the right place and at the right time to capture that man leaping behind the Gare Saint-Lazare, or Trent Parke to photograph the white man walking into the light, or Matt Stuart to snap that pigeon walking along with men in black suits. Indeed, luck matters.. a lot. 1) The first thing that comes into mind is, well, to be at the right place. Always choose a busy location that has good people traffic. Groups of people passing by in transit make good lambs to the slaughter.. I mean subjects to photography. 2) Look for good light.. the type and quality of available light usually dictates what kind of photograph you’ll be able to create, whether it’s hard harsh light that can result to a sinister photo, or soft evenly-distributed light for a more pleasant look. 3) Look for good background. This is quite important since the background can either provide a soft clean canvass that can accentuate the subject, or it can take the limelight and juxtapose with it. So after spotting the perfect location with good light and good background, what’s next? Well… you wait. Look around, stay attentive,… and wait. One of the reasons why I prefer shooting alone is coz i get to concentrate on my surroundings and anticipate if there’s anything worth photographing. If you don’t see anything you like, walk around and start looking for other good spots. You’ll need to do a lot of walking and waiting actually. You’ll need the patience of a saint to catch the devil’s luck. There’s this area in Orchard Road that used to have no shed in the whole stretch from block to block because of an ongoing construction of a mall. It was also located between 2 other malls so the foot traffic here was continuous. I figured that whenever it rains, it would increase my chances of capturing interesting scenes as people are forced to walk under the rain. It would be an opportunity waiting to happen… and it did. After waiting for quite a while during the heavy downpour, I was able to capture this shot. Oh yes, I got lucky. However, luck is only the first thing that you need.. when lady luck shifts to your side and that photographic moment suddenly shows up in front of you, luck disappears so quick leaving you high and dry to your own devices. This is your defining moment, coz that part where you have to capture that moment… luck has nothing to do with that. That will be all you. That’s so true about the luck. The photograph ‘behind the Gare Saint-Lazare‘ is the best example of it. Henri said, that he wasn’t even aware of the man jumping, he just put his lens into a hole in the wall and pushed the trigger. Wonderful insight and generous sharing Dan. All the best in your pursuits! True say, but you should also give credit where it is deserved, Danny. And that is a certain amount of dedication and diligence. Your degree of luck is improved with more time spent on the streets and of course, that witching hour of long shadows in the late afternoon. A confluence of events and circumstances but we have some aspects of control. Oh and a great camera that takes great pictures. Ha. @Michal: Wow really? I didn’t know that about HCB’s shot… what a stroke of luck! Thanks for writing this!.. it’s very inspiring. I always wanted to take this kind of photos, but I feel like I’m disturbing the people. I feel uncomfortable to take shots in that situations. galing mo sir…idol na kita. I just discovered your blog and flicker account. I must say you are truly an inspiration. I’ve always thought about doing what you do, but never had the guts. Maybe I’ll be able to now! Amazing Work! – Add great writing as well! Great post. Just one comment on one example you cited, that of the white man in the Trent Parke pic – I have just finished watching a video of him on Vimeo and it looks like this was very planned and quite technically thought through (basic technical stuff, but still, it was thought through). Sure, luck of a sort was still needed for someone suitable to walk through, but given Trent’s approach I bet he’d go back for hours until he got the shot he wanted. Completely take your point in general though. @Doug: Yup, I also watched that video of him taking that shot (white man). The luck part that I’ve been referring to was the part where the man walked through the light… the technical part is where the photographer has to choose the right location with good light and good traffic, which I also mentioned in the article, which is also exactly what Trent did. That and patience is also needed for this shot. And as you guessed (as I did too), Trent probably waited for hours for that shot. So yes, the technical part is all on the photographer.. luck has absolutely nothing to do with that. Wanderful post. You are very generous in sharing your experiences. In Spanish there is a saying that sums up the issue of good luck on street photography: “A la suerte hay que ayudarla” (“good luck must be helped”). So, good luck and thank you very much. Best regards! I once heard someone say “Luck is when preparation meets opportunity.” It’s stuck with me ever since. Great read, great image. I think you are more patient than lucky. If I had as much time to wait as you do, I would do the same thing you did. boasts an HCA focus of 60 %. I simply want to mention I’m new to blogging and seriously loved your website. Most likely I’m likely to bookmark your blog . You really come with superb well written articles. Thanks for sharing with us your blog site. Hi there, I discovered your web site by way of Google whilst looking for a comparable topic, your web site came up, it seems good. I’ve bookmarked it in my google bookmarks. Hello there, just became aware of your blog through Google, and found that it is truly informative. I am gonna watch out for brussels. I’ll appreciate if you continue this in future. Numerous people will be benefited from your writing. Cheers! My wife and i felt really ecstatic when John could do his inquiry from your ideas he was given while using the blog. It is now and again perplexing to simply happen to be giving away techniques which often other folks could have been trying to sell. And we also remember we have the website owner to appreciate because of that. Most of the explanations you’ve made, the straightforward web site navigation, the friendships you give support to promote – it is most amazing, and it’s really aiding our son and the family understand this matter is excellent, and that’s wonderfully serious. Many thanks for the whole thing! I¡¦ve been exploring for a bit for any high quality articles or weblog posts on this kind of space . Exploring in Yahoo I ultimately stumbled upon this website. Reading this info So i¡¦m glad to express that I have a very excellent uncanny feeling I found out exactly what I needed. I so much unquestionably will make sure to don¡¦t omit this web site and provides it a look on a continuing basis. Good ¡V I should definitely pronounce, impressed with your web site. I had no trouble navigating through all tabs and related info ended up being truly simple to do to access. I recently found what I hoped for before you know it at all. Quite unusual. Is likely to appreciate it for those who add forums or something, website theme . a tones way for your customer to communicate. Nice task..
It¡¦s actually a great and useful piece of info. I¡¦m happy that you just shared this useful info with us. Please keep us informed like this. Thanks for sharing. My husband and i got very thrilled Peter could finish up his investigation by way of the precious recommendations he made in your site. It’s not at all simplistic just to possibly be releasing guidelines which often a number of people may have been selling. Therefore we take into account we’ve got the blog owner to be grateful to for this. The specific illustrations you made, the easy site navigation, the relationships your site give support to create – it’s everything astonishing, and it’s assisting our son and our family understand this subject is thrilling, which is unbelievably vital. Thank you for all! I simply want to tell you that I am just beginner to blogging and site-building and honestly savored you’re page. Probably I’m want to bookmark your blog . You certainly have terrific writings. Thank you for sharing your website page. Generally I don’t learn article on blogs, however I would like to say that this write-up very forced me to check out and do so! Your writing taste has been surprised me. Thank you, quite nice article. Hi there, I discovered your site by means of Google at the same time as searching for a comparable topic, your web site came up, it appears to be like good. I’ve bookmarked it in my google bookmarks. fantastic issues altogether, you simply won a new reader. What might you recommend about your submit that you simply made a few days in the past? Any positive?